I am thrilled to have been asked by the lovely Woolly Wormhead to be the first port of call in the blog tour to launch her new book “Twisted Woolly Toppers”. I got to know Woolly initially online, like so many of us, and we found ourselves sharing and discussing the many issues and complexities that arise for a self employed designer. We also found that we had much in common. Both of us former art and textiles teachers and independent authors, we had both had very mixed experiences of the formal teaching system in the UK, particularly as it is applied to the teaching of art and crafts. I couldn’t begin to calculate how many conversations have been exchanged between us and how many problems discussed and resolved through the power of the web! One of thes e discussions in fact, is what established our working relationship. For those of you who don’t know, I am, well my business is, in a non-traditional way, Woolly’s publisher. When Woolly self published Going Straight, her first book, it was printed by Lulu, a large online publishing/print company. As a customer ordered a book, a single book was printed out and despatched. Lulu’s costs were becoming more and more prohibitive, leaving Woolly as the designer and author, with very little return for all the effort and expense which goes into the publication of a book. The Lulu system also prevented her from being able to offer her print book for sale via retailers or at shows. Self publishing has historically received negative press - the suggestion being that the author couldn’t attract a publisher. More and more designers, artists and illustrators, including Woolly, are making the decision themselves not to look for a traditional publisher but to find a business model which ensures they retain control of their product and receive a viable return on their time and effort. There are unfortunately, marketing issues that stem from this decision to go it alone so to combat these traditional barriers Gavin (my husband) and I had created a new business model for ourselves to publish and sell my book, A Stitch in Time. We set up Arbour House Publishing as our own publishing house, enabling us to also tap into the traditional distribution networks in the publishing world and to help other authors in a similar position to ourselves. To resolve Woolly’s problem, we became her print publisher. Our relationship works very differently to that of a regular publisher and author. Woolly has complete control of her product, providing us with the finished artwork and selling the digital version of the books herself through her website. Arbour House prints and publishes short runs of Woolly’s books enabling us to offer them both to retail and wholesale customers. We primarily sell Woolly’s books through our own online shop and ship them all over the world. What is great for the customer is that they deal either with Woolly or with ourselves so they are never more than an email away from the source of the product they want to purchase! Why I am happy to endorse and publish her books/designs? What do I like about her work, from the perspective as a co-designer and as her publisher? Woolly, is one of the most sophisticated and talented designers I can think of, with a completely instinctive and unstoppable need to design and create. Her enthusiasm and intelligence is inspiring to be around and shines through in her work. Every time I knit a Hat Woolly has designed I learn something new, but without having to struggle as the patterns are so well written, the photography is beautiful, the presentation of the pattern is exceptionally well considered and as a result I admire her work immensely. This is why I am more than happy to endorse and publish her books and also why I love her work from every perspective! 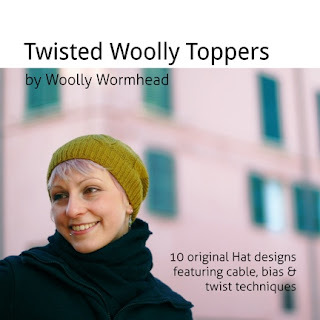 And also why I couldn’t wait to see Twisted Woolly Toppers. I have seen Woolly evolve over the last couple of years into a more and more accomplished designer and this development is what can be observed in Twisted Woolly Toppers. 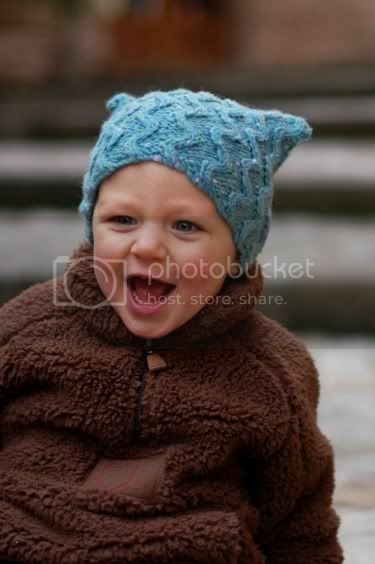 Each of the 10 Hats in the book can be knitted in several sizes often fitting from toddlers right through to men. 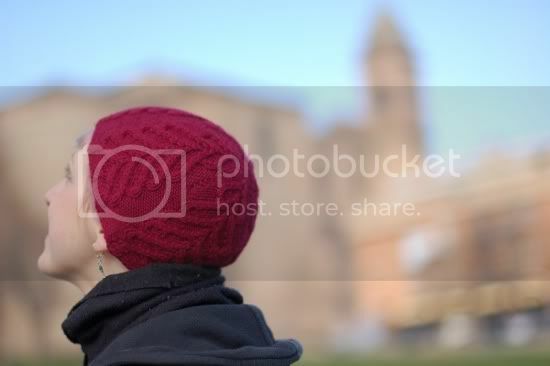 Each design uses twists, cables and bias techniques to echo the beautiful architecture Woolly observes around her in Italy. I particularly love the sketchbook photos of the area included in the book which really help you understand the ideas behind these Hats. The patterns are clearly written with both written and charted options to follow for each design, with different shapes and styles to choose from. For existing fans of Woolly Wormhead this book offers you something new and for those of you who haven’t tried one of her patterns this is a great place to start! The book can be bought either as a PDF direct from the Woolly Wormhead website or the print copies are available from knitonthenet along with her two other books Going Straight and Wee Woolly Toppers. Woolly will be continuing her blog tour next week at www.babylonglegs.blogspot.com followed by the dates listed below. In addition to this she will also be travelling over from Italy next week to launch her book in person at www.makedoandknit.com and then spending a bit of time with yours truly! Fascinating blog post. Most interesting and so lovely to see a non traditional publishing model. Woolly rocks! So good to know that there are knit designers out there with the courage and tenacity to self-publish. I can only imagine how difficult it is to not only get published, but also to be compensated in a way that is both respectful to one's efforts and substantial enough to provide a living. A Stitch In Time is one of the best knitting books I have ever seen, and although my skills are not yet up to the task of all the projects therein (1 1/2 year old knitter here!) I can appreciate the beauty of the pictures and designs, and the simplistic elegance of the written patterns. The fact that it is self-published is inspiring and an encouragement to all knitters and designers who feel lost amidst the sea of established designers. 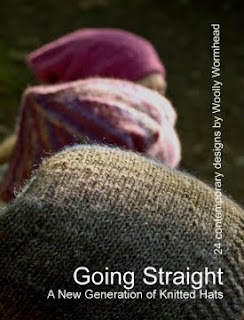 I love Woollys designs and it is so good that she has done so well and found a good publisher! This site is very informative. Very easy to use your tips and tricks. Keep up the good work, you Rock!!! !